NAS storage isn’t hard to come by, but it usually comes at a pretty hefty price. However, combining it with a router is something seldom scene, apart from the obvious Apple Time Capsule. LaCie, though, a company often praised for its aesthetic prowess here on Zath, has come up with the Wireless Space, probably the most direct competition for the Time Capsule on the market. As with any LaCie product, one of the first thing that strikes you about the product is the design. And true to form, the LaCie Wireless Space is not a bad looker, considering it’s a router, hardly a glamorous piece of gadgetry. The smooth black plastic finish is typical of the Neil Poulten design for LaCie, as is the down-facing LED indicator which is either blue, green or red depending on the state of the power and connectivity. There isn’t much else to it, really, all the ports are found at the back as you would expect, as is the power button. The brick itself sits on four rubber feet which not only keeps it grounded on a smooth desk surface, but also raises it a little for ventilation for the in-built hard drive. The setup of the Wireless Space was remarkably easy in my experience. It comes packed with a software CD, which contains the LaCie Network Assistant suite for Windows, Mac OS X and Linux, which I found mighty impressive, and tests on the Windows and OS X installs worked without a hitch. The setup assistant software guides you through connecting your router to the network, setting up access and security in the form of WPA keys, with a host of other options, which really amount to all the usual, but we’ll talk about that later. The device itself can be setup in a variety of different ways. Firstly as a standard router with built-in NAS, or as a switch with the same NAS functionality. Most commonly, though, the device will function as a wireless router along with the 1/2TB of built-in storage, which adds an extra dimension of functionality on top of what you’ll find with a standard router. So, this is how I tested it. Of course, a big part of being a wireless router is how well it connects to wireless devices. On my home network, where I tested the router, which is hooked up to Virgin’s 50Mb network, I found that I could pretty much get full and consistent speeds throughout the house, only degrading slightly when overlapping with the neighbours, a common fault with wireless signals. At close range I tended to get speeds of roughly 40Mbps, which is pretty comparable to the wired-in speeds using a regular router at peak times of usage, and the lowest recorded speed was 32Mbps, which is pretty sufficient to say the least. In theory, the signal will last way up to 250 feet, though unfortunately I’m yet to save up for a house big enough to test that in, and I’ll be damned if I’m sitting on these harsh winter streets. For the read/write speeds, I’ll have to credit CNET, as the guys there have had the privilege of concocting a table of comparison for NAS setups, pitting the speeds against dedicated NAS solutions and other router/NAS combo’s. The LaCie Wireless Space tends to do OK, pretty much trouncing the Time Capsule with a 50% speed increase, though it lacks behind quite miserably against the likes of the ASUS TS Mini and HP MediaSmart Server LX195. Check out the table below. Darker shade indicated read speeds and the other the write speeds, with every number measured in Mbps. In terms of functionality, there isn’t a lot that’s outstanding with the LaCie Wireless Space. It has all the usual features that you would expect with a router, including Dynamic DNS and Port Forwarding as well as security measures with the usual variants of WEP and WPA/WPA2 encryption. The Wireless Space is void of dual-band networking, working only on the 2.4GHz band used by 802.11 b,g,n ruling out 802.11a. When you’ve set up the Wireless Space, and connect to the NAS, a pair of folders are available. The first being MyShare, to which access is restricted to the administrator using a password selected on startup. The other is OpenShare, which as you may have guessed by the name is open to anyone on the same network. Neither of these folders can be deleted, nor can they be renamed. No new folders can be created either, not on the root level anyway, only sub-folders of those already mentioned. On a similarly disappointing note, you can not set up different user accounts for the Wireless Space, so there can only ever be one root folder restricted to the administrator. Frustrating, when there’s a family each trying to backup their own iTunes libraries, for sake of argument. There is, though, a USB port on the rear of the Wireless Space, which allows you to add your own external drive in the same way that you might with a standard router, though this sort of destroys the point of having a terabyte or two built in. The Wireless Space is particularly adept when handling media, I found. For starters, it will automatically appear in both Windows Explorer and Mac OS X Finder, but also it will, once setup, automatically recognise iTunes libraries, or any UPnP or DLNA-compliant devices and chuck out some media files stored on the built-in hard drive. On top of that, if you’re the sort who likes to use the dreaded BitTorrent method to get your media, you’ll enjoy the Wireless Space as it allows you to download your torrents without a PC direct to the built in drive. 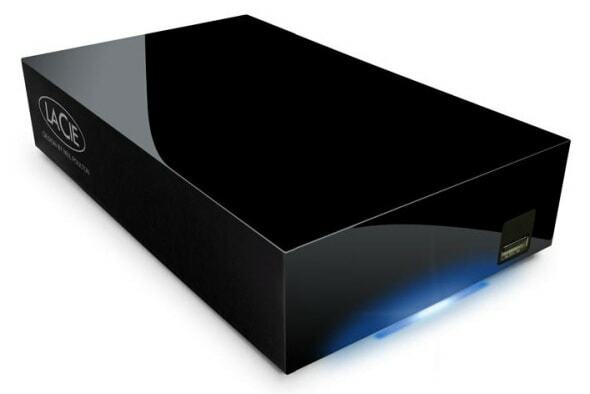 Much like the Time Capsule, if you’re looking to set up a seamless, integrated home media setup, this is quite ideal. With prices hovering around £150-160 for the 1TB option, and £200+ for the 2TB depending where you’re shopping, the price point isn’t too bad, when compared to the Time Capsule. Unfortunately, though, the web console used to manage the network, from which you can reset and/or apply settings, shut down the router or reboot it and alter security settings, is a little complex for a basic user, but it is usually necessary and unavoidable. Also, there are only 3 Ethernet ports on the back, which is a little meagre if I’m honest. However, it performs reasonably well in all departments, looks good and has some interesting features for handling media. All in all, the LaCie Wireless Space is a good choice and you probably won’t be disappointed with the results in your home.